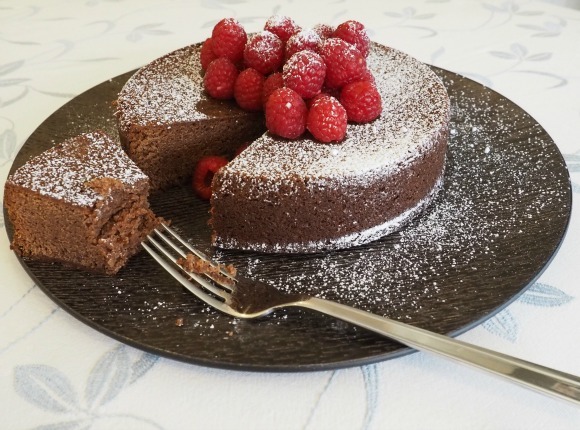 My Chocolate and Raspberry Jam Cake is a chocoholics dream – rich, dark chocolate spiked with sweet berry flavours in a fudgy, brownie-like cake that is almost impossible to resist. The best part is, it simply could not be easier to make. This is the recipe I turn to when I want a fabulous dessert but I really don’t have much time. It comes together in a saucepan and bakes to rich chocolate gorgeousness while you get on with other things. One proviso, my Chocolate and Raspberry Jam Cake is not a beautiful cake when it comes out of the oven. Like so many of us, it needs a bit of help to look its best. I always flip the cake over when it is cool and serve it bottom side up. The bottom is smooth from baking in the cake pan and looks so much prettier than the top. Don’t however, be tempted to frost it, unless you have a seriously sweet tooth. In this case go ahead but please don’t say I didn’t warn you! 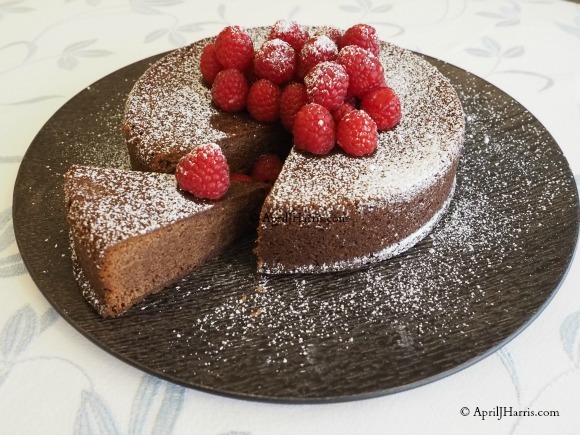 A little icing sugar (confectioner’s sugar) sifted over top of this Chocolate and Raspberry Jam Cake can transform it, especially if you have some raspberries to put on top. If raspberries are in short supply, this is the perfect opportunity to try using a stencil. Sift the icing sugar over top of the stencil. Then, once the icing sugar has had a chance to settle, lift the stencil off carefully using masking tape handles. I’ve also covered the top of the cake with whipped cream and scattered dried edible rose petals over top. I’ve considered using edible gold or silver sprinkles as well – I think they would be gorgeous. The recipe began life as ‘Store Cupboard Chocolate Orange Cake’, from Nigella Lawson’s wonderful book,‘How To Be A Domestic Goddess’. I have played with the proportions of the ingredients a bit over the years, not so much as to risk upsetting the alchemy that is baking, but just enough to mean that I can make it easily using cup measures. Weight measurements can be hard to convert. 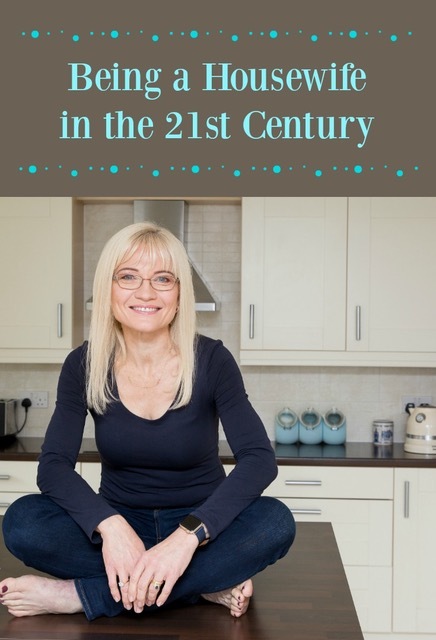 While conversion charts can be helpful, I find that more often than not you end up with awkward measurements – one cup plus 1 tablespoon and a teaspoon – for example. This is far too fiddly for me and honestly, I prefer using cup measures anyway as that was how first I learned to bake. I have ended up using slightly more jam and flour and a bit less sugar but the recipe still works beautifully. As with so many things, the quality of your results depends on the quality of your ingredients. This may be a simple cake but I urge you to choose a seriously rich dark chocolate. I love to use Cadbury Bournville. I discovered it when my husband worked for Cadbury many years ago and have been addicted to its rich flavour ever since. My late father loved it, particularly the British version, so I also use it in memory of my Dad and of pleasant afternoons spent sharing a bar of Bournville and catching up. Equally, use a good seedless raspberry jam, fresh free range (pastured), preferably organic eggs and high quality butter. This will make an immeasurable difference to the result. You could whip up a Chocolate and Raspberry Jam Cake in moments and surprise your family with an amazing dessert tonight. If you don’t have the ingredients, chances are you can find them at your local corner store. Go on, what are you waiting for? Preheat to oven to 350°F (180°C or 170°C for a fan oven). Butter a 20 cm (8 inch) springform cake pan and line the bottom with baking parchment. Sift the flour, baking powder and salt into a medium bowl. Set aside. Melt the butter in a large saucepan over medium heat. Keep an eye on it, you don't want browned butter! Stir in the chocolate with a wooden spoon and continue stirring as it begins to melt. Before the chocolate is completely melted, remove the pan from the heat. Stir until the butter and chocolate are thoroughly combined. Stir in the jam, sugar and beaten eggs, combining thoroughly. Beat in the dry ingredients which you set aside earlier. Do this in three additions, beating until the batter in relatively smooth. Pour the batter into the prepared pan and bake for 40 to 50 minutes or until a cake tester inserted in the centre of the cake comes out clean. . Cool in the pan on a rack for ten minutes before turning out on to the rack to cool. You can eat the cake warm if you don't want to decorate it with icing sugar but if you wish to pretty it up a bit you need to let it cool completely first. I suggest carefully turning the cake over before decorating and serving. If you enjoyed this cake you make also enjoy this Chocolate and Blueberry Pudding Cake. Good Afternoon April, Oh I have to tell you, I do love a nice chocolate cake. Funnily enough Bourneville Plain chocolate was my father’s favourite chocolate, so I look forward to trying your recipe. I have pinned it to make later in the month. It looks fantastic, and have no doubt – I’m making this cake pretty soon!! Thank you! I hope you enjoy it, Winnie 🙂 It’s such a rewarding cake to make – really easy but very delicious! Thank you! I hope your little ones enjoy it, Swathi! What a lovely dessert, April! The cake sounds just perfectly delicious and it looks beautiful. I love the raspberries. April, to me combining chocolate with raspberry is like a match made in heaven! Your cake looks absolutely mouthwatering…a must-try very soon! This cake is so pretty! It’s simple and elegant. Love it. Chocolate and raspberry are always a delicious combo! This cake looks scrumptious! Thank you, Abby! It’s one of my favourite combinations. I love chocolate and orange too! Oh my Goodness!!! That Cake looks absolutely amazing!!! I have never thought of adding jam directly to the cake dough! I gotta try this must be so good!!!! April! 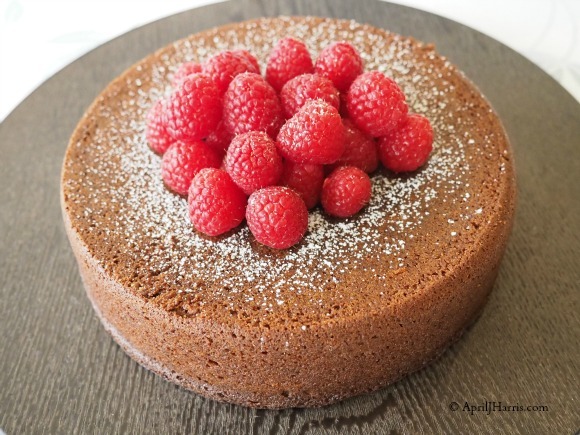 I saw your pic and had to click to the recipe because my bf’s birthday is coming up in mid-Nov and I’ve been thinking what kinda cake to bake him! I might very well make this! Thank you so much for the inspiration – plus, the jam in the cake is genius! I love this. So pretty and the addition of the jam is sure to make it moist and flavorful. I always love your cakes, and this one is sure to please! Looks beautiful, stunning! Love the raspberries on top! My favorite combination, chocolate and raspberry. This looks lovely! What a fantastic looking chocolate cake, April! So pretty. Oh I used to love this Storecupboard cake recipe and have tweaked it in a similar fashion myself although not lately. My favourite thing about the recipe is that you can actually mix it all in one go if you use a heatproof bowl or double boiler to melt the chocolate. Thanks for the reminder! PS I wonder whether you lived near Bournville. I used to go the art college there many moons ago – you could smell the Cadbury’s chocolate in the air most days! My kinda cake! Love it! Oh just the kind of cake I like, chocolate cake has to be good and moist! April, WOW! This cake looks and sounds so perfect!!! oh this cake is so lovely. I love just the dusting of powdered sugar so it’s not too much, just right. This cake sounds divine. yummm! Looks like a delicious cake! I will have to try it one day soon. I hope you enjoy it, Agata. It really is tasty! I love the look of this delightful cake — no fuss or muss — and not a ton of time dedicated to frosting and embellishing! My kind of dessert! Beautiful! I’m a big fan of Nigella and have made the recipe from HTBADG quite a few times. I loved that you used raspberry jam instead – it sounds delicious! I might try that next time. Thanks for the inspiration! I’m a big Nigella fan too, Thanh. Thank you, I’m glad you liked my variation! this cake look absolutely delicious! It would be the perfect dessert to end a Valentine’s Date in! Thank you so much, Megan. It really is lovely for Valentine’s Day! Is there any way you could send me the UK measurements in pounds and ounces, I’m not sure how to measure out cups. I’m so sorry, I don’t have the measurements in pounds and ounces. For cups, all you need are a set of measuring cups like this https://www.johnlewis.com/john-lewis-partners-stainless-steel-measuring-cups-set-of-4-silver/p3859109 They are available nearly everywhere now, and most are quite reasonable. This is a more expensive set, but I chose the link as the picture was clearer. I’m about to write a blog post on recipe measurements as I feel that if the recipe is written in weights, you should use a scale, but if it’s in cups, you should definitely use the cups. If you do use cups, be sure to measure everything as a level measure. So, scoop flour or sugar into the cup and then level it with the flat side of a knife. Having said that, I did adapt this recipe and part of that involved converting it to cups from a recipe originally in grams. Although there are online tools available, sometimes the conversions are not very accurate, so I prefer to do any conversion manually through testing in my own kitchen. The gram measurements (which are slightly different from my recipe, but which I know will work as this was the recipe I made first, before I adapted it) are 125 g butter, 100 g chocolate, 300 g of preserves (I used jam), 150 g caster sugar and 150 g flour. I hope this will help a bit! Don’t forget the salt, eggs and baking powder – those measurements won’t need converting though.